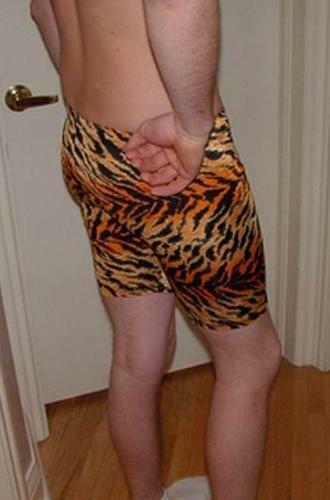 These Tiger shorts I won at an eBay auction in 2004. Seller was rowval, and it was given this description at the auction: NWT, Unisex! For Ladies & Men!! Hot Shorts! Size Medium: Exercise Shorts, made out of Nylon 85% Lycra 15% (aka Spandex) Mid thigh length. Leopard Print WOW!! Very Very unique pair of Spandex!! Very comfortable shorts that are perfect for biking, running, crew, rowing, exercising, casual wear, clubbing etc.